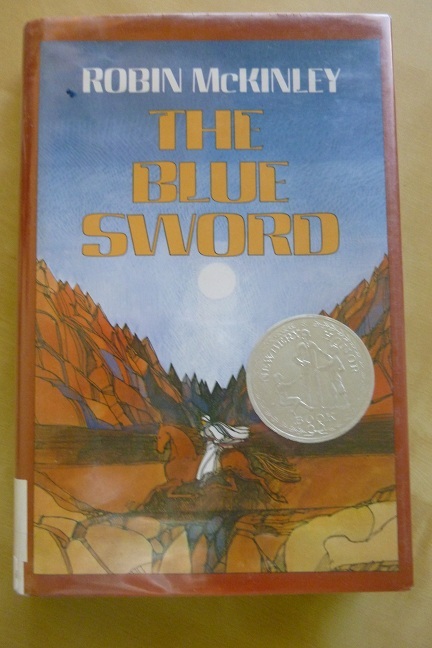 Continuing recent trends, I reread The Blue Sword by Robin McKinley for Once Upon a Time, and for my goal to reread old favorites. I’ve no idea when I last read this, but it may have been middle school. By now, it’s like an entirely new book–not a bad thing, when it’s by one of my favorite (but not prolific enough!) authors. The heroine of the story is Harry, who travels from what seems to be loosely Victorian England, out to the edge of the empire. The Homeland has never quite conquered the desert and hills of Damar, where the natives still follow the old ways–and are rumored to have magical power. When Harry is abducted by the Damarian king, she begins to forge a new identity among a foreign people she’s strangely drawn to–and finds a role in their coming war with the North. I feel like this plot summary makes the book sound like Indian Captive, which it isn’t at all…but telling more would give too much away. I like Harry as a protagonist–she’s intelligent and capable, and always puts on a strong appearance even when she’s secretly unsure. She makes some leaps in learning and skills that are, um, improbable to say the least, but there’s a magical explanation so I’ll give that a pass… McKinley also succeeds in making the Damarian king, Corlath, into a sympathetic character, when he very easily might not have been at all. Besides lots of magic and swordfighting and epic legends, possibly the coolest part of the story is Harry’s animal companions. She has the world’s most amazing horse, and if that’s not enough, there’s a wildcat too! It was funny reading this right after Fellowship of the Ring, because in some ways the writing style seemed even more Tolkien than Tolkien himself–more what I expected Tolkien to be. And by that I mean that there is considerable detail given to what the landscape looks like, the clothing styles, the exact details of saddles… Most of the time that was all right and even interesting, and mostly the book still moved at a reasonable pace. The only real trouble I had was at the beginning, and “trouble” might be putting it strongly. It’s just that there’s a fair bit of set-up explaining the political situation and Harry’s personal past, and it all comes out rather dry. This is particularly funny because McKinley is known for throwing readers in without much backstory or explanation…but this was an early book. Evidently her writing evolved. So if you pick this one up and find it slow, at least go on until Harry’s abducted–I found it picked up considerably then. This book has made me very much want to reread The Hero and the Crown, which I only remember marginally better. That one is a prequel, focusing on legendary characters who are frequently referenced here, and I look forward to reading their story. I’ve got to read this one! I’ve read so many by her, but not this one, though surprisingly it is on my bookshelf. Thanks for the great review, I think I might be reading it for OUaT too! If it’s on the bookshelf, what could be easier? Definitely worth the read!